Fair Warning: I shared these with a friend this afternoon. He bit into the cookie readily. Then I thought he looked perplexed. It is indeed an unusual blend of strong lemon and the savory aromatic basil. The recipe intrigued me when I first noticed the cookies in a Bon Appetit feature– a recipe from their test kitchen. So I finally baked them at 7 AM today. 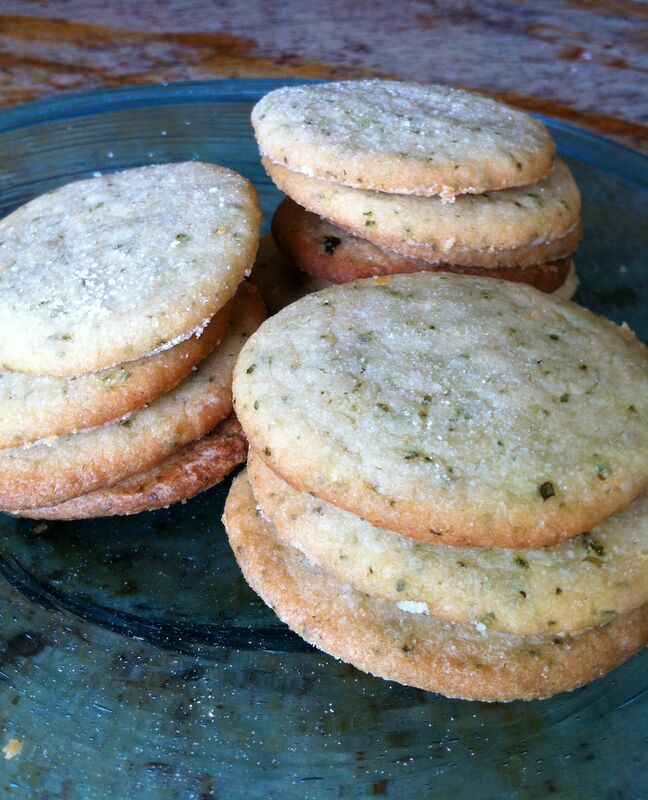 To me, it’s a delicious sour-sweet-rich-buttery-savory-basil cookie. Not usual, perhaps odd, but I really like them. I like food to take me, even shock me, to new, unfamiliar places — if the path is well constructed. I think this one is. I’m copying the recipe exactly as it is in Bon Appetit. The citation is below. You be the judge! Lemme know? and salt in a food processor. Pulse until large, moist clumps form. Place on a large baking sheet, spacing 2″ apart. Sprinkle tops of cookies with sanding sugar, if using. Bake until edges are brown, about 14-15 minutes. Transfer to a wire rack; let cool.